The Commerce Department reported a dramatically faster pace of new home sales in September. The annual rate of 667,000 houses sold rose 18.9% from the August and increased 17% from the year-ago pace. The monthly data tend to be volatile and not doubt were affected by September hurricanes along the Gulf Coast. Southern states accounted for about 60% of the nation’s sales in September, up from 57% for all of 2016. Figures showed the inventory of new houses for sale remains relatively low, which housing economists say is one of the reason for escalating prices that are keeping some prospective buyers out of the market. In a separate report, Commerce said durable goods orders rose 2.2% in September, mostly because of a takeoff in commercial airline orders. Excluding volatile demand for transportation equipment, orders grew at a moderate pace of 5.5% from September 2016, which suggests U.S. manufacturing gains from rising economies across the globe. Non-defense capital goods orders excluding aircraft – a proxy for business investment – rose for the third month in a row and increased 3.8% from the same time last year. The moving four-week average for initial unemployment claims fell for the fourth week in a row, recovering 14.3% of the 16% rise in claims following the Gulf Coast hurricanes. Average jobless applications remain 33% below the 50-year average, according to data from the Labor Department. Benefits filings have been lower than the long-term level every week since early 2013, a sign that employers are reluctant to let workers go, which eventually should boost wages and encourage consumer spending. The National Association of Realtors said the pace of existing home sales was unchanged September, though it fell 3.5% from September 2016, the fifth year-to-year decline in six months. An economist for the trade group said demand continues to exceed supply in most housing markets, which has been raising prices and squeezing prospective buyers. First-timers buyers were 29% of September market, tied for lowest in the last two years. 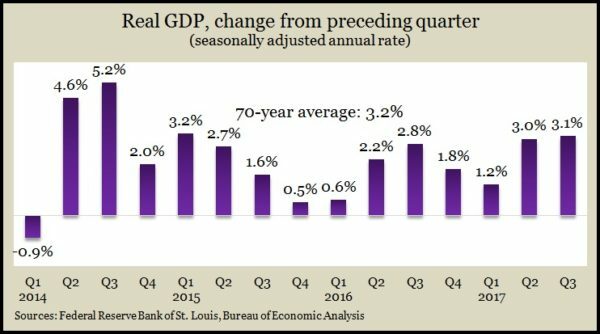 The U.S. economy grew at a 3.1% annual rate in the third quarter, the best third quarter in four years, according to the first of three estimates by the Bureau of Economic Analysis. Gross Domestic Product picked up with a strengthening in consumer spending, which rose at a 2.4% pace, as well as gains in business investments, inventories and exports. Residential spending declined at a 6% annual pace. The preliminary data also showed the Federal Reserve’s favorite inflation gauge rising to 1.3% from 0.9% in the second quarter but still lower than the Fed’s 2% target. Considered a leading indicator of consumer spending, The University Michigan consumer sentiment index rose in October to its highest reading in 13 years. Through the first 10 months of 2017, the index averaged its highest level since 2000. In particular, feelings toward personal finances – boosted by higher incomes and the wealth effect of higher stock prices and home values – approached record heights. A university economist said consumers are content with moderate economic gains and expect them to continue another five years.